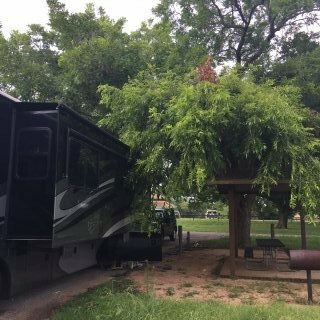 We stayed at this park with a Texas Motorhome club. We booked this park a year in advance for our group. We had 23 motorhomes for this rally. We were in contact with the park manager several times in the weeks before the rally and were told the sites would be right in front of the rally hall. On arrival we were told they had another rally group stay the previous week and had decided they wanted to extend their stay. We were being moved to a different rally hall because the other group wanted the one we booked. They were also parked in the sites we had reservations for our group. Our 23 motorhomes had to be parked all around the park including behind the rally hall. These sites were terrible. No concrete to park on and so unlevel we had to put several stacks of boards under the front wheels and jack to try to level. The rally hall we were given was not clean. There were dead bugs and live bugs all over the Rally hall. They told us they had sprayed for the bugs and were coming to clean up but they never did and ants were everywhere also. The Hall was hot. The air conditioning could not cool the building. We had to bring in fans on the floor to try to keep cool. We had to turn off our electric water heaters and use the propane because there was not enough electricity for the park. We had to park in front of the RV in the gravel road because the sites are too short to park in the site. We will never return to this RV Park. They should have moved the other group if they wanted to stay. We were booked way in advance (1 year) and then just moved out. Our reservations of 23 coaches meant nothing to these people. It was too late for us to move our rally to another location. We camped at American RV Park & Sales in a Motorhome. This is a very well run park. We stayed during Spring Break. This park is perfect for family fun. There is so much for children to do outside. Pools, river,trampoline,mini golf, etc. We saw children having so much fun at this park. We asked to be parked at the back of the park so it would be quite area. No kids with us. We were escorted to our site. There is a nice cement picnic table and fire ring. I did also look at the rec hall and saw the staff cooking pancakes for everyone that wanted to eat breakfast. Good store on site also. Close to lots of stores and restaurants. We loved this park. 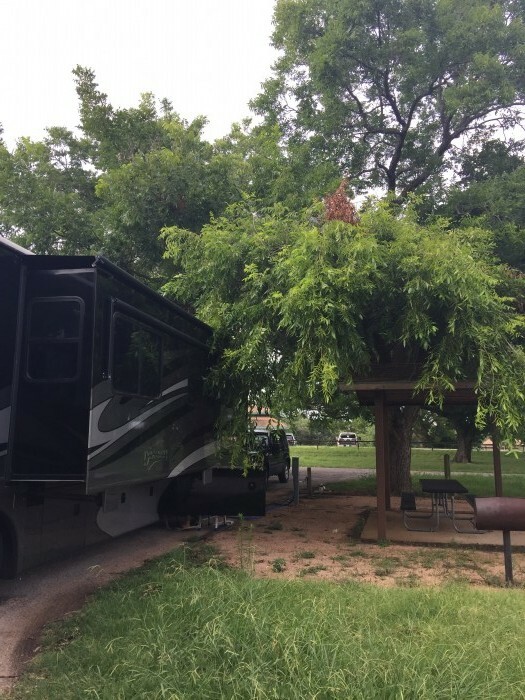 We camped at Yogi Bear's Jellystone Park Camp-Resort: Guadalupe River in a Motorhome. Billy Gene's restaurant has good food and a great view of the river. Reasonable prices. Mammacita is great for Mexican food. Large HEB for groceries is close by. This park is right off the freeway so easy access but far enough to not have noise from the freeway. Nice views as it it high up on a hill. We were promised a long site with great view overlooking the hills but on arrival it had been given to another camper. We were put next to a maintenance building with no view. The site was level but very short for our 40 ft. rig. We told the office we were going to move on the next morning since we were not happy with our site. They refunded the next 2 nights we had prepaid for. There are a lot of full time RVs in the Park. They had a free breakfast on Saturday in the Rec Hall but we did not attend. We camped at Top of the Hill RV Resort in a Motorhome. About 7 miles to grocery store or restaurant. This park is very to a busy road and is very loud with traffic all night including big trucks. The trees are in need of trimming back so they don't scrape the top of the rv's trying to get into the sites. The sites on top of the hill are 50 amps but there are only a few. The sites near the lake at the bottom of the hill are 30 amps and has a great view of the lake. It's shady in most sites. The grass and weeds are very high. No mowing has been done at this park in many months. We were there for July 4th and the park was full. There were lots of campers in tents and the grass was so high it was bad to not be able to see a snake. We love the location of this park. It is on the beautiful lake and close to town but it needs lots of maintenance that it's not getting. We camped at Midway Park COE in a Motorhome. This park is on the lake and has a public boat ramp. The park is close to shopping, restaurants and the VA clinic. The price is what keeps the campers coming.